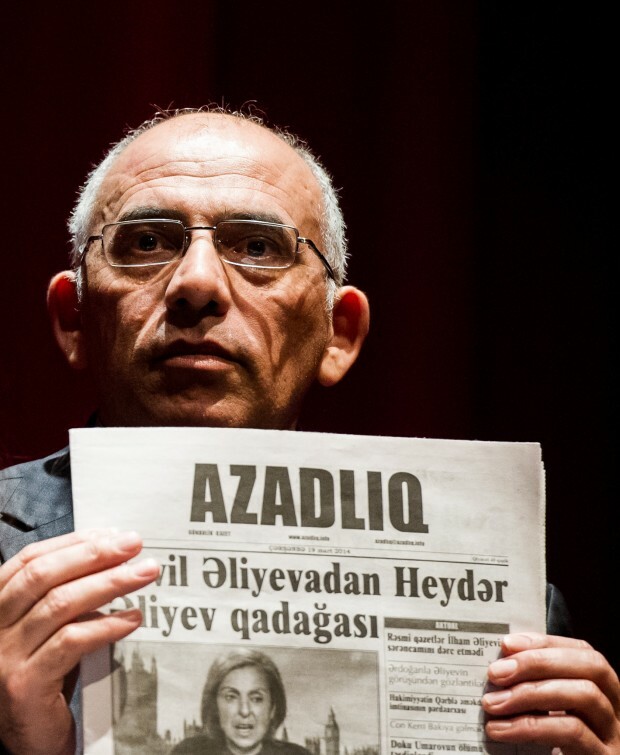 One of the few remaining independent media outlets in Azerbaijan, the newspaper Azadliq has continued to report on government corruption and cronyism in spite of an increasing financial squeeze enforced by the authorities. The country likes to present itself as a modern democracy, but it is widely recognised as an authoritarian regime where opposition is often brutally cracked down on and critical voices silenced. In this environment, Azadliq works to hold the ruling Aliyev family, and the rest of the powerful elite in the country to account. The latest attacks on the paper came hot on the heels of the country’s 2013 presidential election, where Ilham Aliyev was reelected in a vote labelled flawed by the OSCE. The paper has been been the target of defamation suits that have resulted in £52,000 in fines. Courts found Azadliq guilty of “damaging” the business reputation of Kabira Mamedova, director of the Baku-based Bina shopping centre, and Taghi Ahmadov, CEO of the Baku Metro, after the paper published articles critical of their activities. The paper’s bank accounts have been frozen since 25 October, and Gasid, the state-owned press distribution company, has not been transferring payments that reflect the paper’s sales; according to Azadliq’s latest calculations, Gasid now owes about £44,000. Azadliq’s journalists also face continuous threats. On 4 October 2013, Azadliq reporter Ramin Deko was part of a group of journalists assaulted by a pro-government mob while covering an opposition rally in the central Azerbaijan town of Sabirabad. He also alleges he was abducted and beaten up on 3 and 4 April 2011 by law enforcement bodies. While he was illegally detained, he said he was told to stop writing critical articles and to change his workplace to a pro-government newspaper. Despite this, Azadliq refuses to back down, and continues to cover the activities of the Azerbaijan corrupt elite. “We play a significant role in providing people with alternative information. Our staff are underpaid, overworked, and yet are fully committed to their work”, said deputy editor-in-chief and acting editor Rahim Haciyev. Haciyev, who joined the paper in 2001, talked to Andrei Aliaksandrau about why his work at Azadliq is so important. Index: Your publication faces constant pressure from the authorities. Have you ever thought of leaving for a safer job? Haciyev: No, this is my work, and it is not only a job, it is my form of expression. The fight for free speech is sacred for me. This is the way of opposing lawlessness and tyranny, and working for Azadliq provides me with a possibility to continue this fight for what I believe in. Index: What is the wider media landscape in Azerbaijan? And how does this fit into the wider political and social situation? Haciyev: Repressive steps taken by the government of the country have led to significant restrictions of media freedom. Today there is a real threat of independent press in Azerbaijan totally disappearing. The country lives under a strict authoritarian rule. Activists of political opposition, civil society organisations and independent journalists face constant pressure. There are more than a hundred political prisoners behind bars in Azerbaijan, including journalists. Index: What is your view on the Snowden/Greenwald revelations about mass surveillance? Haciyev: Our newspaper covered the story. I think a government should keep its secrets – but it is the role of the press to inform the public and share the information they gather. And any kind of pressure exerted on the media is nothing but a violation of the freedom of expression. Index: Technologies have changed the media market globally. Do you think newspapers are still relevant? Haciyev: I am sure printed newspapers will keep their relevance for a long time. Despite the development of the internet, we can still see great demand for newspapers among the audience. For us,our website is getting more and more popular, and the circulation of the printed newspaper is going down – but it is not because people are losing their interest in the printed publication, merely because of all the restrictions and pressure our authorities put on us.